I’ve been involved with local sustainability for over 6 years, chairing MHSG for the last four. After participating in a number of projects to make our local area more sustainable, I decided to do an MSc in the Economics and Policy of Energy and the Environment at UCL, which I started last September. The course has been fascinating so far – though a bit demanding on my maths skills, which have not been exercised for very many years! One of the modules I took last term was Planetary Economics, which looked at the political economy of energy and climate change. The lecturer, Professor Michael Grubb was closely involved with the Paris climate talks and our final lecture included a panel discussion on the Paris Agreement hosted by the BBC’s environment correspondent Roger Harrabin. Participants included several leading academics and a senior civil servant in the Foreign and Commonwealth Office. In the week before Christmas I also attended a discussion on the implications for the energy industry at the Energy Institute. Given the huge importance of the Paris Agreement I thought I would write up what I learnt. The general consensus from academics, civil servants and energy industry leaders is that what was achieved in Paris was astounding. That is not to say that they think that we are out of the woods on climate change, anything but. However given where we were 6 years ago at the end of the Copenhagen climate talks, huge progress has been made. The main disagreements at Copenhagen related to ‘burden-sharing’. The ‘developing’ countries felt that the industrialised countries in Europe, US and Australia should do much more to cut emissions since they had produced most of the greenhouse gases. The industrialised countries on the other hand thought that countries such as China, India and Brazil which now generate nearly 50% of global emissions, should be far more ambitious in their efforts to make reductions. The Copenhagen talks stalled in an embarrassing diplomatic failure, and the hopes of green groups such as ours were dashed. Paris was very different. Firstly, there was considerably more planning – world leaders did not want another disaster. A new ‘bottom-up’ approach was to be taken, whereby each country would submit its own commitment to cut carbon, in line with the particular constraints faced by that country, eg economic and development plans. Secondly, both China and India’s positions have shifted considerably since 2009, as air pollution has hit their cities. Images of school children with facemasks have put pressure on the ruling party in China to act, and in India a new prime minister (Narendra Modi) has launched a very ambitious renewable energy programme and has put climate change high on the list of government priorities. 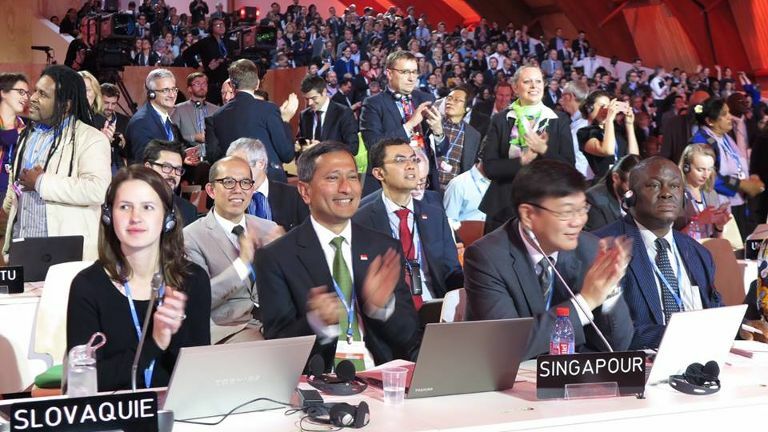 Nearly 200 countries submitted an ‘intended nationally determined commitment’ (INDC) prior to the Paris talks, representing a strong buy-in to the UN process for emissions reduction. At the discussions I attended at UCL and at the Energy Institute, several points relating to the agreement emerged. 1) The existing commitments made by countries through their INDCs will result in a temperature rise of around 2.7- 3.0 degrees, so these commitments are not enough and will need to be ratcheted up in the next few years. The agreement includes a ‘stock-take’ every five years to review progress and raise commitments. 2) Something called ‘bio-energy with carbon capture and storage’ (BECCS) will be essential to ensure the global temperature increase is well below 2 degrees. BECCS involves growing plants (which absorb carbon dioxide) and then burning them, and storing the carbon dioxide emitted permanently underground. The attraction of BECCS is that it results in ‘negative emissions’ – carbon dioxide is taken out of the atmosphere. However there are several major challenges. The technology has not yet been proven, and there are concerns about the amount of land that will be needed to grow the plants (biomass). Scaling up BECCS will mean that land for animal grazing will be restricted, and not compatible with developing countries moving to a high-meat diet as they get wealthier. 3) The death-knell has been sounded for coal. With high associated carbon emissions and air pollution, most countries are now reducing their coal usage. The exception to this is India, where GDP is expected to increase 5-fold by 2040 with a resulting energy demand that cannot be met by renewables in the short term. The share price of coal mining companies has plunged in recent months. This partly reflects slowing economic growth in China but it also reflects investors’ concerns about the long term future for coal. 4) Whilst there has been considerable progress in moving to lower carbon electricity, a lot more action is needed on renewable heat and on transport. This means faster improvements to buildings energy efficiency to reduce heating requirements, investments in district heating and cooling, and more investment in electric vehicles and alternative fuels, to reduce our dependence on oil. 7) The Paris agreement has provided a strong framework for monitoring emission reductions made by each country. There is now much more transparency around carbon reduction plans, and whilst the commitments are not legally binding, the general view is that countries will be reluctant to lose face by missing their own targets. 8) For the first time provision for addressing financial losses incurred by countries due to climate change is included – known as ‘loss and damage’. What does this all mean for the UK? Since the Climate Change Act was passed in 2008, the UK has been regarded as a leader in its response to climate change. It was the first country to adopt five-year carbon budgets, mapping how emissions would be reduced by 80% by 2050. However since the General Election in May 2015, there have been some significant policy reversals, which have not gone un-noticed in the international community. Funding has been removed for carbon capture and storage demonstration projects, feed-in-tariffs for renewables have been slashed, zero-carbon standards for new homes have been cancelled, and most of the programmes to encourage home energy efficiency have been stopped. It now looks likely that the fourth carbon budget (for the period 2023-27) will be very difficult to achieve and that renewable energy targets for 2020 will not be met. The question is whether the Conservative government will introduce new policies to get the carbon emissions reductions back on track. At a London level, Boris Johnson set a target to reduce London’s emissions by 60% by 2025 – but the influential Carbon Brief organization believes current policies will only result in a 40% cut. So there is clearly a lot more lobbying of local and national politicians to be done, which is where organisations like MHSG come in. In addition to campaigning, our practical work on the ground to reduce local emissions remains more important than ever, whether it’s our information-sharing workshops, our open green home events or our database of local installers. The Paris talks do represent a major step forward, but there is a lot of work to be done to turn good intentions into action and there is no room for complacency. I’d like to know more about the way London decides on it’s carbon reducing initiatives and how it tracks them. These have seemed hard to find before. This was a very helpful summary, thank you very much!